We are all overheating here in London (I’m not complaining) but whilst we are wearing as little as possible, its really important not to forget about your underwear, especially as it’s likely to be sticking out most of the time. The heat however, is not the only reason to be showing off what’s underneath but also the fact that sheer fabrics are such a huge trend at the moment. If you have the legs even wear a sheer skirt with a plain pair of boy pants underneath. There is definitely an art to wearing your underwear to show appropriately and stylishly without looking tacky, and if your bra straps are going to be on show then make sure its a pretty strap and not a shabby looking cream/grey colour from excessive washing. During a trip to Amsterdam a few years ago I came across the loveliest underwear brand called Sam Friday. I never quite found the equivalent here, not only the pretty and different styles and fabrics but the fit and feel of the underwear has been amazing and they are still going strong. 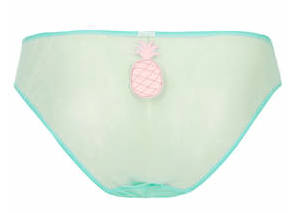 I came across the most gorgeous summery underwear right here at….. yip Topshop! and needed to share it all with you.